One of the most common ways to increase floor space without building a new facility is to create an intermediate level by constructing a mezzanine. 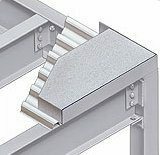 Mezzanines can be designed in many different fashions; structural steel, cold rolled steel, wood, free standing or integrated to name a few. No matter what design you choose, one of the biggest decisions when building a mezzanine is the type of decking (or flooring) to utilize. 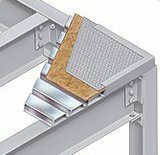 One of the most common options for decking a mezzanine is to use corrugated steel decking material covered by a layer of Advantech. Advantech is a high quality product superior to ordinary plywood and OSB options due to its enhanced strength, stiffness and moisture resistance. Its advanced destiny provides a solid and secure resistance to foot traffic, and is designed to withstand weather conditions better than ordinary plywood. This decking method is considered to be our most economic selection and materials are readily available. Another viable option similar to Advantech is ResinDek. ResinDek is high density composite flooring, recommended for mezzanines requiring a solid floor subject to heavy loads from the use of pallet jacks, carts or dollies. This option is installed over 20g. corrugated steel decking and has a load capacity of up to 2,000 lbs. It has an acryseal surface which is not only skid-resistant but also easy to clean. Available in a Gray Diamond Seal finish, ResinDek is ideal for interior decking where heavier loads and a more “finished” look are desired. 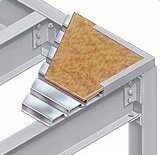 While ResinDek offers an upgraded mezzanine floor from Advantech, if durability is a serious factor in your decking decision, you may want to consider a diamond plate or concrete floor. Heavy-duty steel tread plate (diamond plate) is generally installed over Advantech. Advantech is mounted over corrugated steel deck to provide greater durability with higher point load and wheel load capacities. 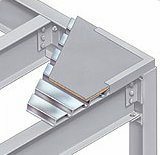 It also enables a quiet floor for the work environment as opposed to having diamond plate directly over a steel deck (which can also be a viable option if insurance requires no combustible material be used). This decking is considered to be our second most durable flooring. The most durable type of mezzanine flooring by far is concrete. With a high point load and minimal transmission of noise through the deck, concrete should be used in high capacity industrial and military applications where the mezzanine is considered to be permanent. Steel decking (corrugated steel VL decking) is provided with pour stop needed to pour of up to a 6-inch concrete floor. 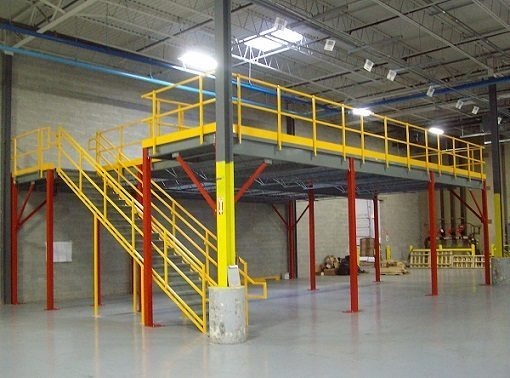 There is one other option for mezzanine floors which is preferred in many applications because of the insurance benefits. Steel grating, commonly referred to as bar grating or press-locked grating, is a common choice in the waste management, mining, and food service industries. Steel grating allows for air, light, heat, and fluids to pass through the deck surface. It is strong, durable and virtually maintenance free. There are a few different types of steel grating, the most common ones being: press-locked and welded bar grating. Press-locked grating is a system of interlocking, perpendicular bars; it provides a smooth clean look and excellent lateral support. It exhibits the same strength, long life and openness as welded grating. Steel grating can be an economical choice due to the fact that in many cases, insurance companies will only require sprinkler systems above the mezzanine, since the open grating allows the water to reach lower levels. 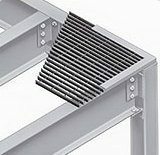 Combine this with less under-mezzanine lighting requirements and the apparent “up-charge” for steel grating becomes more of a “break-even.” Black finish is standard with steel grating; however, various color options and galvanized finishes are also available. In the end, there is no single “best” choice for mezzanine decking. Carefully consider your application, budget, and insurance requirements to determine the best floor for your situation. If you are still unsure, or would like an experienced professional opinion, give Panel Built a call at 1-800-636-3873 FREE.